Rested and hopeful from their sojourn in Rivendell, we take our first steps into the untamed wilds. 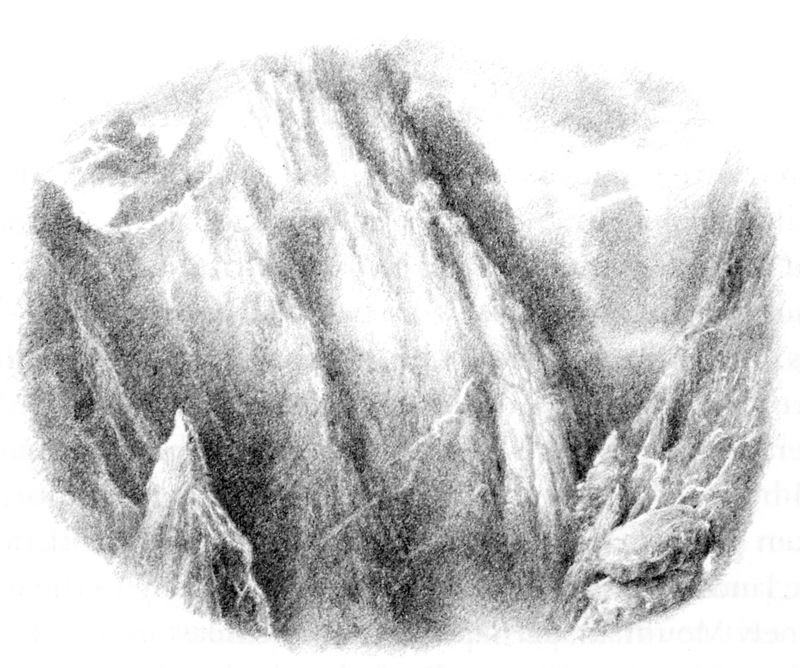 Last week I wrote briefly about Rivendell as the place where everything hangs in balance, and as a reminder that there is evil in the world. We know that the road ahead is not devoid of life, but that we are stepping away from civilization as we know it into the realm of Here Be Dragons. The trolls may have been out of place in Chapter Two, but now we're headed into their realm. Fortunately for everyone, the literal dragons won't occur for some chapters more. Our little party of adventurers isn't quite up to that challenge just yet. We see some growth of Bilbo here in their second brush with danger. With the trolls he went and put his foot (or to be exact, his hand) in it, ending with everyone captured before Gandalf arrived to save the day. When they settle into the little cave at night it is thanks to Bilbo that they are not all captured, his cry of alarm is what enabled Gandalf to escape capture and ultimately rescue the party. 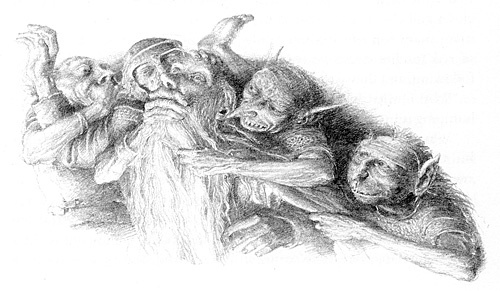 We also see growth of the dwarfs accepting Bilbo as one of the party, as they physically carry him with them in their flight from the goblins. Perhaps this is just decent humanity (dwarfanity? ), but it is a concerted effort that they share among themselves so that Bilbo is not left behind. I love the use of language in this chapter, and how it creates this warren our party has fallen into. 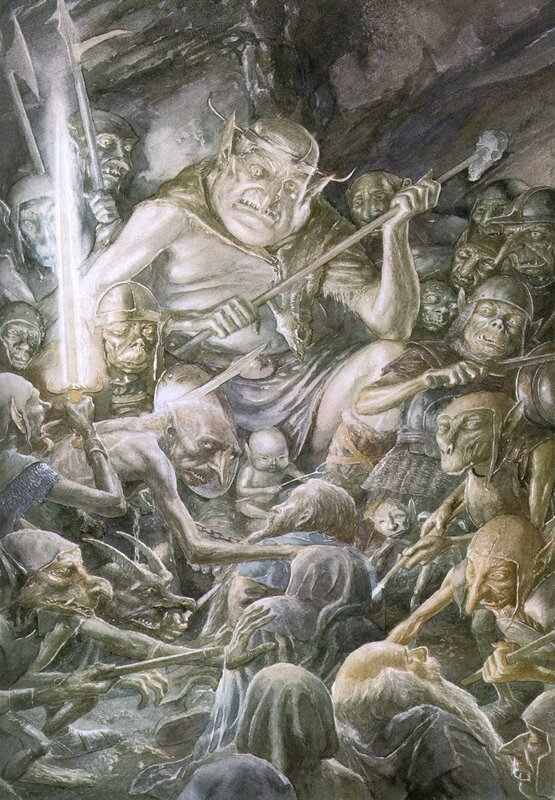 The goblin song is jarring and percussive in nature, yet has the well constructed lyricism you see throughout all of the songs Tolkien wrote. He gives us images of dark and dangerous warrens as he describes passages that are "crossed and tangled in all directions," and glaring red light. "Now goblins are cruel, wicked, and bad-hearted. They make no beautiful things, but they make many clever ones"
The goblins whip and pinch and laugh. They howl and jabber and skitter. They have long memories and recognize ancient Elven swords. And they know when to slip on soft shoes for silent stalking, to move quietly enough that not even a wizard nor a hobbit hear their approach. When we met the trolls they were nasty and mean, but tempered with gross humor. With the goblins that humor is largely gone, leaving perhaps a gleeful menace. After my frustrations with Jackson's adaptation of the Chapter Three, he truly takes us Over Hill and Under Hill here. The storm giants were glorious, the terrain treacherous, and the goblins menacing, wicked, and cruel. We honestly get the story with very little in the way of plot or narrative additions. Thorin makes clear that Bilbo is only along on sufferance, and that he is by no means accepted as one of the party. While I feel it was unfair to rob Bilbo of his heroic moment of warning, I do think that Jackson used this change to good effect in terms of character interaction and development (which is a challenge for anyone not Bilbo, Thorin, or Gandalf). And, to be honest, the change of sounding the warning along with the other tweaks are a set up for Thorin starting to actually accept Bilbo after they all escape from the mountain. Jackson did splice Chapter Four into the middle of Chapter Three, splitting Bilbo off early from the dwarfs and sending him down to Gollum's lair, but it does make some sense. Can you imagine Bombur (or any of the others) carrying Bilbo on his back? And a panicked bid for freedom in pitch dark tunnels is a lot more exciting in a book than in an adventure film, whereas a flight along torch-lit chasms screens so much better. Regardless, I'll be summarizing Riddles in the Dark along with the appropriate chapter rather than where it appears in the film. What I really want to thank Jackson for in this segment is giving us the music. Do I think it worked better as a song from the goblin horde? Totally. But the Goblin King was perfectly fabulous and grandiose (oh, Dame Edna, you always have a special place in my heart, even as a greasy troll with a tumorous-looking neck waddle), and it was well worked in. Music is such a part of The Hobbit, with songs appearing regularly throughout the whole story, and the music always tells us something. We even have an orchestral medley of the Misty Mountain song as the various generic adventuring soundtrack throughout the movie.